sailboat. : What I Wore: Dreaming is Believing. Oh gosh, I'm going to apologise in advance for the amount of photographs in this post, I know it's a bit excessive but I couldn't resist since I was joined by such a special guest mid shoot! I pretty much got photo-bombed! 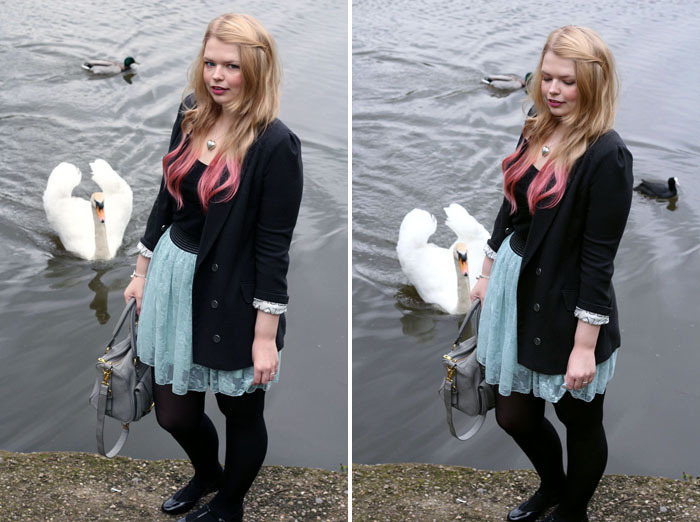 Yep, photo-bombed by a freaking GIANT swan. 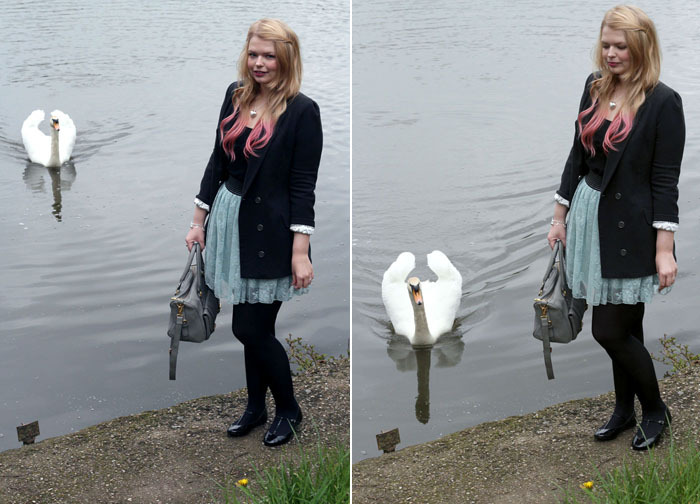 I'm not going to lie, I was a teeny bit nervous (note me giving the swan some serious side-eye there!) you gotta keep your eye on those things, I did not want to get pecked! It popped up out of nowhere, they're sneaky those swans! The poor thing probably only mooched over to see if I had any food, sadly I did not, but they sure are elegant creatures! Blazer: Primark. Vest Top: H&M. Skirt: Primark. Bag: ASOS. 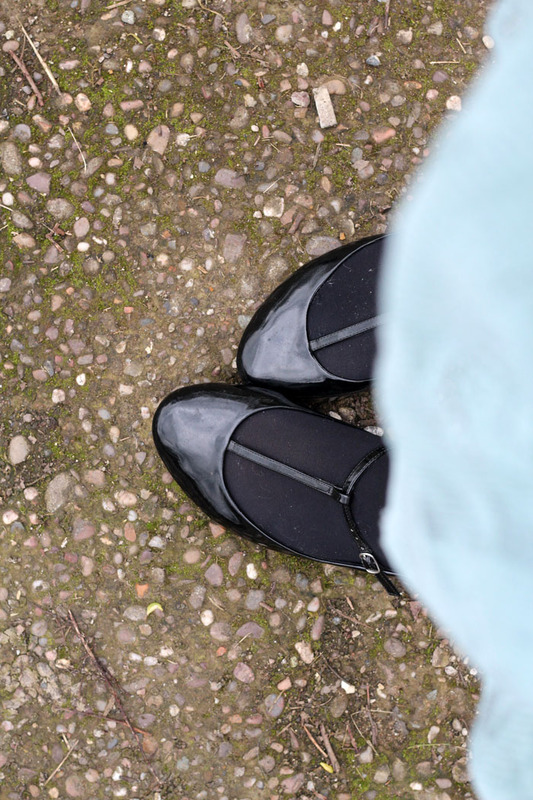 Tights: Matalan. Shoes: ASOS. 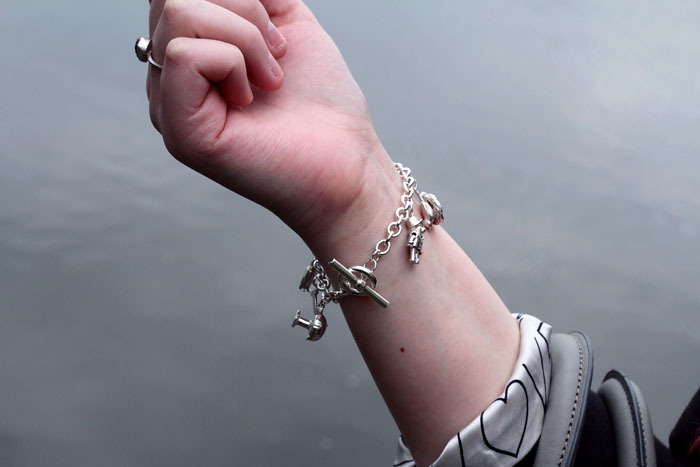 Charm Bracelet: gift. 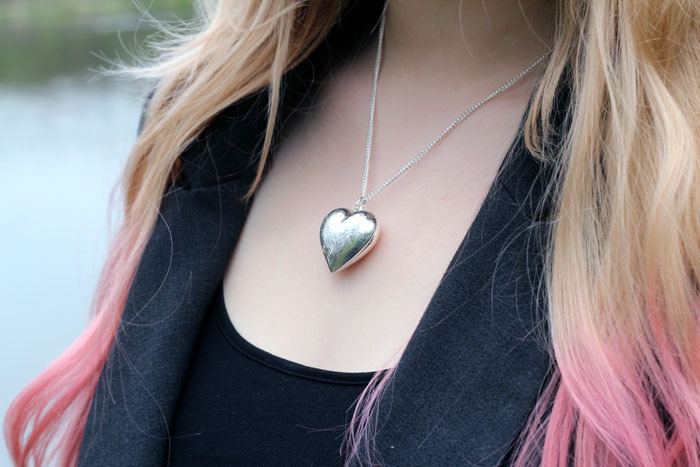 Necklace: Find Jewellery. ♦ Heart Ring: Scape Jewellery. Uncut Ruby Ring: Studio 59. Base: Illamasqua Satin Primer, MAC Studio Sculpt foundation, Collection 2000 Lasting Perfection concealer & Benefit Erase Paste concealer. Hair: Directions Carnation Pink hair dye & Enrapture Totem Styler ♦(setting 1-2-1) for loose waves. Have you ever been photo-bombed by someone or something while you were taking outfit of the day photographs? Or have you ever had anyone approach you and ask what you were doing? I get some super odd looks sometimes, anyone would think taking photographs was super weird! when i first saw the swan I was thinking the same way as you (get pecked by swan). Best photobomb ever. 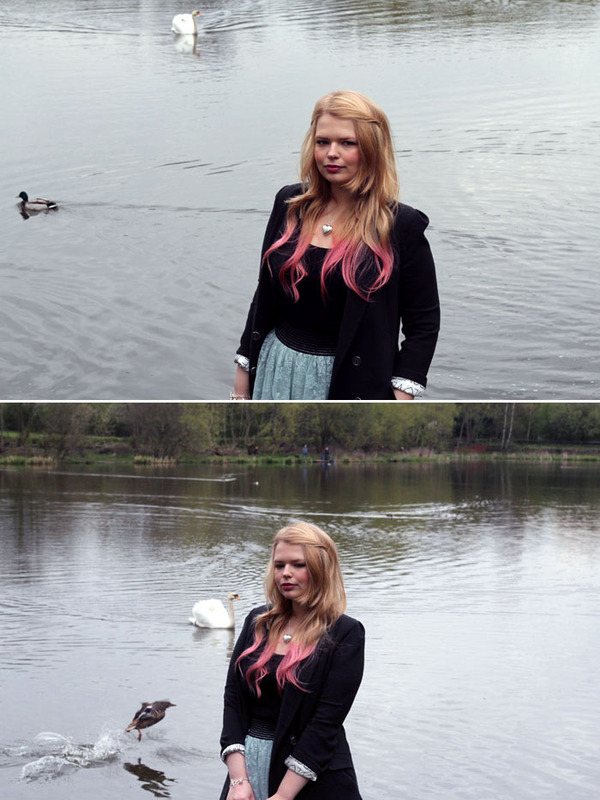 I'd have hated that though, swans scare the bejesus out of me. They're evil! You looks so cute and I'm loving your hair! That bag is gorge. Beautiful photos! Love your hair and that skirt, very pretty! keep the photos coming! Each shot is lovely and I just adore your pink tips. Oh my goodness the photos are so, so dreamy and beautiful and I love your hair so much. LOL at the swan! They're supposed to be pretty mean, too! Your outfit is adorable. 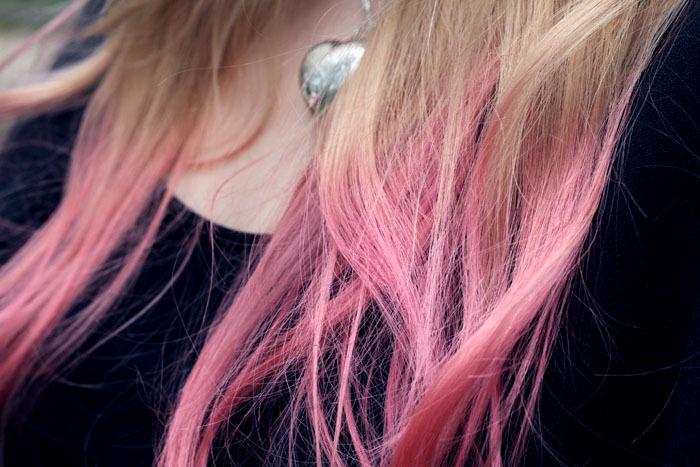 Loving your pink tips, they look so summery! This skirt is also adorable.